A consortium led by BAM has reached financial close with the National Roads Authority (NRA) for the €230 million N25 New Ross Bypass PPP project. All project and financing agreements have now been signed and the project implementation work can get underway immediately. The project will support up to 2,100 jobs locally and across the country and will see construction activity commence in March of this year. The PPP project involves the design, construction, financing, operation, and maintenance of approximately 13.6km of new dual carriageway and various junctions and road bridges, including the 887m crossing of the River Barrow, which will extend from Pink Point in Co. Kilkenny to Stokestown in Co. Wexford. When it is completed this three tower extradosed bridge will be the longest of its kind in the world. The PPP project will comprise a valuable strategic component of the national primary route network. The N25 New Ross Bypass will provide a high quality safe link within the South East region and ease congestion by providing a bypass of New Ross town on the N25 and N30 where significant delays currently occur. The project will be undertaken by a BAM and Dragados joint venture. The new road will be operational in January 2019, which will be followed by a 25 year concession period for the consortium. BAM has a long track record in delivering building and civil engineering projects under the PPP model, which includes: the Newlands Cross Junction and M11 Arklow to Rathnew; the M1 Dundalk Western Bypass; the M7 / M8 Partlaoise Bypass; and the N25 Waterford Bypass PPP Motorway schemes. BAM has also completed the design, build, finance, and maintenance of eight schools under Schools Bundle 3 PPP and work is currently ongoing on four schools for Schools Bundle 4 PPP. BAM is also working as preferred bidder with the NTMA for the development of four new courthouses and the refurbishment and extension of three existing court buildings, also under PPP. 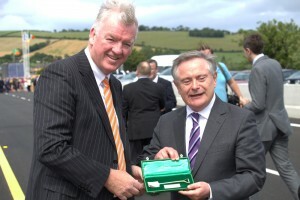 Our image shows BAM Chief Executive Theo Cullinane with Minister for Public Expenditure and Reform, Brendan Howlin, T.D.